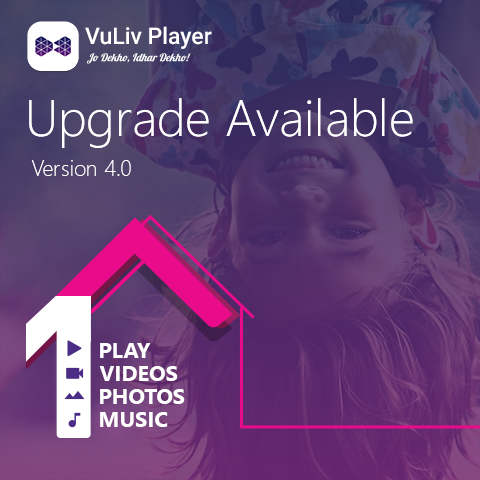 Home Uncategories Good News, VuLiv Player v4.0 is Out! Good News, VuLiv Player v4.0 is Out! Finally, the wait is over! Lately, we’ve been burning a lot of midnight oil to introduce a whole new world of entertainment. We haven’t just revamped your home for photos, videos and music but joined hands with some of the best-known names in the entertainment industry like, Voot, Scoopwhoop, Happify, Hotstar and many more! So, this is what we have done for the online world of entertainment but closing the loop is what drove us towards revamping the offline world of entertainment or the place where it’s all about you, your memories, your music, your way. V4.0 is the biggest update we’ve ever rolled out and we are looking forward to it. Calling out all our community members, we urge you to download the latest update and let us know what you feel about it and what else we can do to make your favourite media player even more beautiful, even more playful, even more useful.